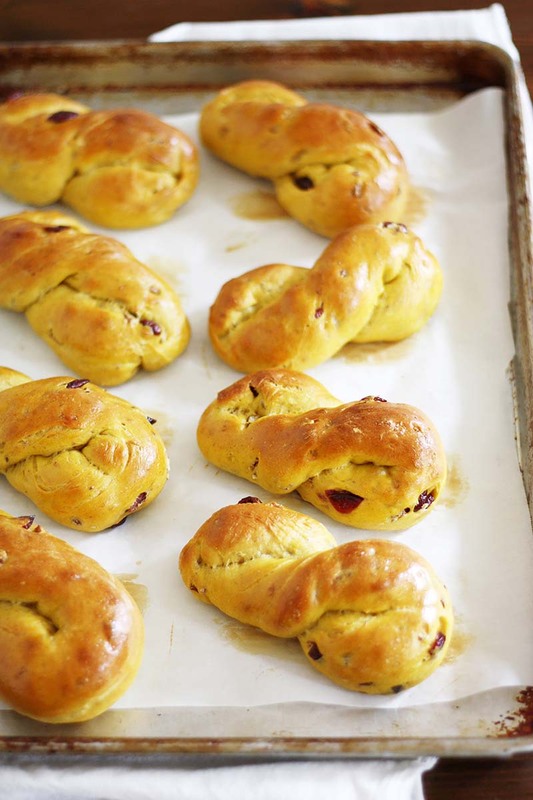 These beautiful twists are perfect alongside a harvest celebration meal. In large bowl, combine 1 cup flour and yeast. Whisk in warm water (110-115°F) until well combined. In small bowl, combine pumpkin, maple syrup, oil, salt, ginger, cinnamon, allspice and egg; stir into flour mixture until smooth. Gradually whisk in about 2 cups more of flour until smooth. Using wooden spoon, gradually stir in enough of the remaining flour to make soft dough. Turn out onto lightly floured surface; knead for 7 - 10 minutes or until smooth and elastic, adding more flour if necessary. Place dough in lightly oiled bowl and turn to grease top. Cover; let rise until dough tests ripe, about one hour. Punch down dough; turn out onto lightly floured surface. Knead in cranberries and nuts. Divide dough into 16 pieces and roll each piece into a 12-inch rope. Fold each rope in half, twist strands once, pinch ends to seal and place on lightly greased or parchment-lined baking sheets 2-inch apart. Cover; let rise until indentation remains after touching, about 45 minutes. Brush beaten egg over twists. Bake in preheated 425°F oven for about 15 minutes or until twists are golden brown. Remove from baking sheet; let cool slightly on racks before serving. Recipe featured at Girl Versus Dough.